Over the decades, I have been to many international meetings, sometimes to catch up with colleagues, sometimes to visit a new city. And always – hopefully – to learn something. Usually I come back with renewed optimism and reassurance that there are lots of good things happening around the world and much of this is relevant to what I am doing back home. As many people have said before, the main learnings can often come as much from corridor conversations, as plenary sessions! The International Conference for Emergency medicine (ICEM) meetings are particularly special to me, as I have a 30 year association with the International Federation for Emergency Medicine (IFEM) going back to the second ICEM in Brisbane 1988. The most recent IFEM meeting was no exception to my previous experience, with a lot of social activity, many opportunities to reconnect with old friends and a magnificent city to enjoy. There were many great talks and discussions covering the full range of clinical emergency medicine. My optimism for the future was ensured because of a number of key events that took place during the meeting. As a Past President of IFEM, I take a keen interest in the Federation and whether it can fulfill its mission and vision. The election of the first female President - elect for the Federation (Sally McCarthy), was an important milestone. A clear vision for the future and financial stability were demonstrated at the meeting by the new President, (Jim Ducharme) and will prove key to future viability of the organisation. The most profound take home message actually occurred at the plenary sessions (I know – this is unusual).There has been a substantial change in direction over the last 2 years for the IFEM under the Presidency of Lee Wallis. He has initiated a much greater focus on our collaboration with the World Health Organisation (WHO) and our ability to assist countries with poorly developed emergency care systems. The collaboration with the WHO has been helped by the appointment of an emergency physician (Teri Reynolds) as the WHO Trauma and Emergency Care lead in Geneva. The plenary talk at ICEM, given by Lee Wallis and Teri Reynolds was significant in setting the scene for future developments of emergency medicine internationally. Teri’s deep understanding of emergency systems of care has led to a major refocus of the WHO effort to reduce death and morbidity from trauma and other emergency conditions. The previous belief that emergency medicine was only for rich countries, with established high functioning care in the major medical specialties has been reversed. Ensuring robust emergency care systems prior to epidemics and disasters is now believed to be a basic building block in harm mitigation by humanitarian agencies and the WHO. This simple concept, was not appreciated in the past. The importance of emergency systems and training in emergency care have now been brought to the forefront of WHO thinking with policies and training kits being piloted internationally. Perhaps even more importantly, emergency care is being seen in a different light even in countries where there is no disaster or epidemic. Rather than seeing emergency medicine as an expensive “add on” to the basic health care system for a region or country, it is a foundation stone. Across basic disciplines such as maternity care, infectious disease, trauma and paediatrics, where there is a large volume of excess morbidity and mortality, a good emergency system can ensure basic health services are provided. This can also include targeted preventive health measures and community education if well resourced. It was significant that Judith Tintinalli, one of the all-time guiding lights in emergency medicine, emphasised this point in her plenary session. 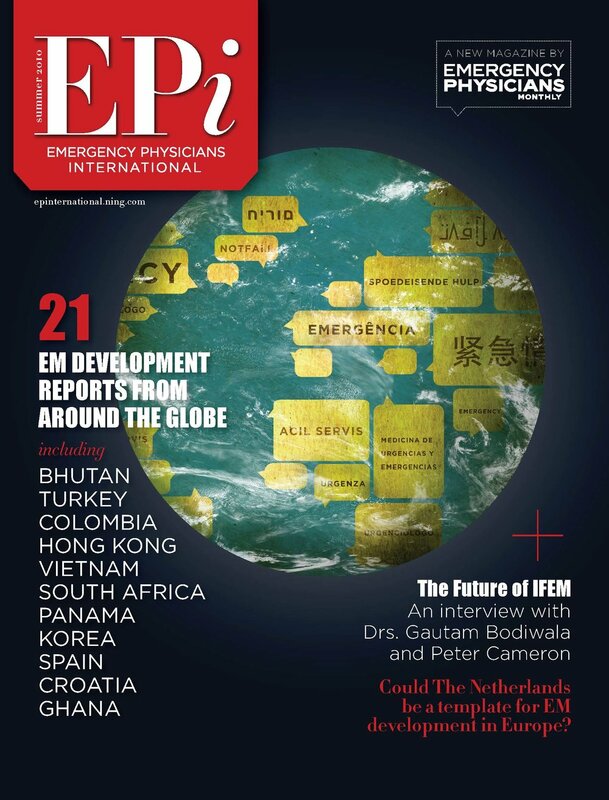 It is clear that emergency medicine is finally entering a mature stage of development and the major health agencies internationally are seeing the potential in working with emergency specialists to ensure stable, safe and effective emergency systems to reduce preventable morbidity and mortality. It is an exciting time to be part of this global movement.